SINGAPORE, Feb 6, 2018 - (Media OutReach) - Avnet Asia partnered with Xilinx(R) in the "Lab to Market" Tech Talk Series, organized by the A*STAR Postdoc and Early Career Scientists Society (A*PECSS) at the JTC Launchpad in Singapore. Presenters from Avnet Asia, Xilinx and A*STAR discussed the future of driverless cars and other embedded vision applications. "Avnet has been playing an active role in supporting and nurturing start-ups in Singapore and across Asia, to guide their ideas to production. This initiative with A*PECSS allows us to interact directly with the makers to better understand and address their needs," said Andy Wong, senior vice president of global design solutions, Avnet Asia. "The adoption of embedded vision will transform IoT applications and unlock innovations across key industries such as automotive. Avnet's hardware and software solutions for Advanced Driver Assistance System (ADAS) equips automotive engineers with essential information to further innovate and realize the potential of IoT technologies." With an emphasis on embedded vision as the next engineering frontier, key market opportunities in the region span automotive & transportation, security, industrial, healthcare, retail and consumer technology. Embedded vision enables machines to respond through algorithms, digital processing and visual intelligence, including facial and object recognition, and is being increasingly adopted for a variety of applications from smartphone cameras to driverless vehicles. Octavius Lim, senior director of Xilinx APAC channel sales, commented, "Embedded Vision is one of the most exciting fields in technology today. Xilinx sees embedded vision as a key and pervasive megatrend that is shaping the future of the electronics industry. For years, Xilinx and Avnet have helped customers and start-ups accelerate the development of embedded vision applications in markets where systems must be highly differentiated, extremely responsive, and able to immediately adapt to the latest algorithms and image sensors. With Singapore's Smart Nation initiatives, we see strong potential in Singapore to apply embedded vision innovations for advanced driver assistance drive and surveillance security." The convergence of advanced technologies including embedded vision, sensors, connectivity and deep learning is essential to make driverless vehicles safe and efficient. 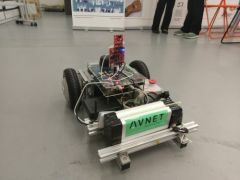 Supporting Singapore's agenda to introduce driverless vehicles from 2022, Avnet showcased its latest autonomous guided vehicle (AGV) model utilizing the MicroZed(TM) Embedded Vision Kit. From enhancing security by providing real-time and more accurate analytics, to automating tray return at food centers, the AGV is ideal for helping makers accelerate product development. The A*PECSS 'Lab to Market' Tech Talk Series, which is regularly held in A*StartCentral, serves as a platform for researchers and industry comprising start-ups and entrepreneurs to exchange insights on technological advances and product development under various themes, with the aim of bridging research and development (R&D) and the marketplace, and accelerating product innovation and development. From idea to design and from prototype to production, Avnet supports customers at each stage of a product's lifecycle. A comprehensive portfolio of design and supply chain services makes Avnet the go-to guide for innovators who set the pace for technological change. For nearly a century, Avnet has helped its customers and suppliers around the world realize the transformative possibilities of technology. Learn more about Avnet at www.avnet.com. Xilinx is the leading provider of ALL PROGRAMMABLE semiconductor products, including FPGAs, SoCs, MPSoCs, RFSoCs, and 3D ICs. Xilinx uniquely enables applications that are both software defined and hardware optimized - powering industry advancements in Cloud Computing, 5G Wireless, Embedded Vision, and Industrial IoT. For more information, visit www.xilinx.com. An autonomous guided vehicle (AGV) designed by Avnet using the MicroZed Embedded Vision Kit.